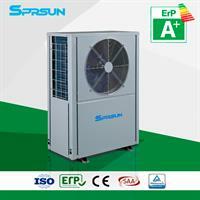 Air to water heat pump, EVI technology available for -25C working condition. Use Copeland EVI compressor and Danfoss expansion valve, R407C refrigerant, heating capacity 10kw@A20/W55, 8kw@A7/W45. A+ ERP label available.